The reason why AP decided to hide the data prior to 1958 becomes immediately obvious. 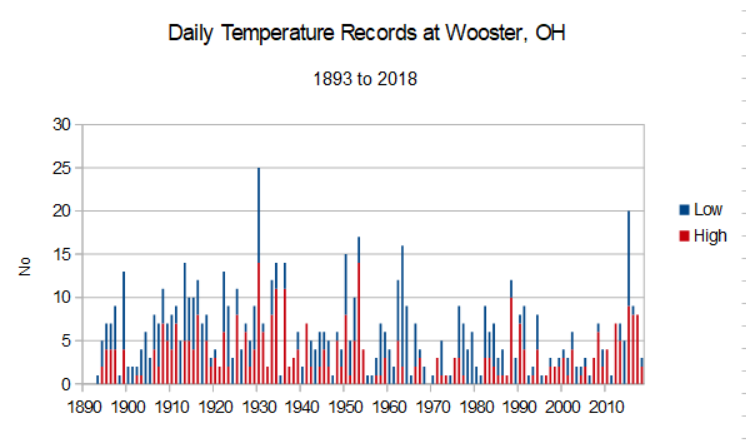 Hot records were far more common not only in the 1930s, but 1950s as well. We also see far fewer cold records since around 1990. It is that lack of cold records which has skewed the ratio of hot/cold, and not an increase in the hot ones. In fact, the opposite is true. 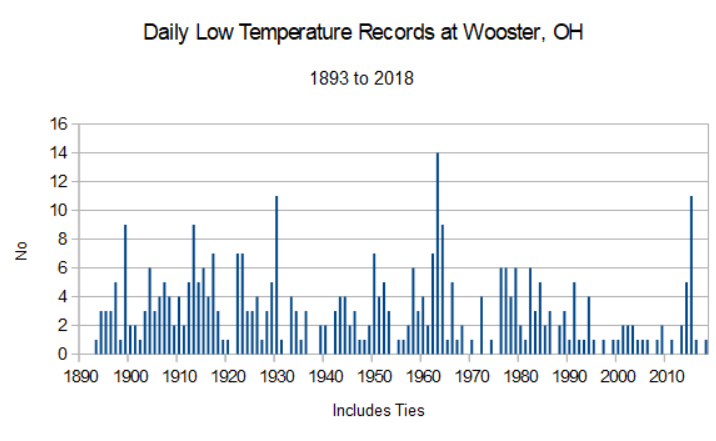 The number of extremes, hot and cold added together, have been getting fewer in recent years...Borenstein claims that we are seeing more and more “record breaking heat” and “more extremes”. The opposite is true. 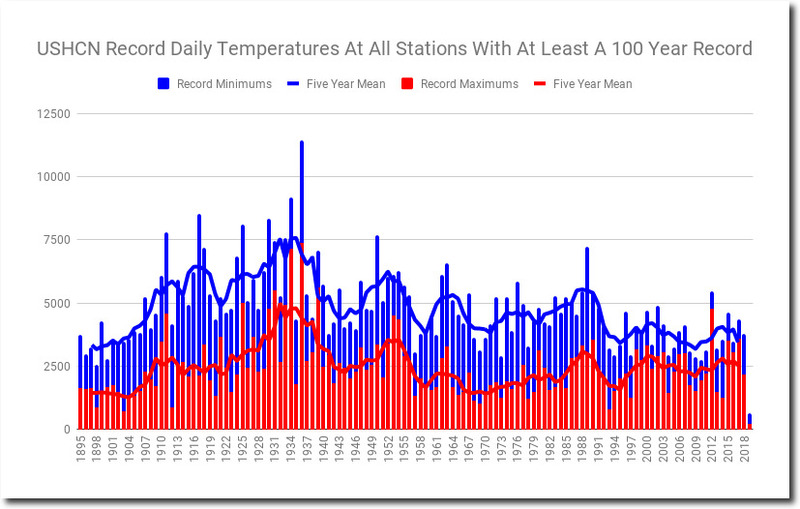 Hot records are less common than in the past, and cold records have become even rarer. 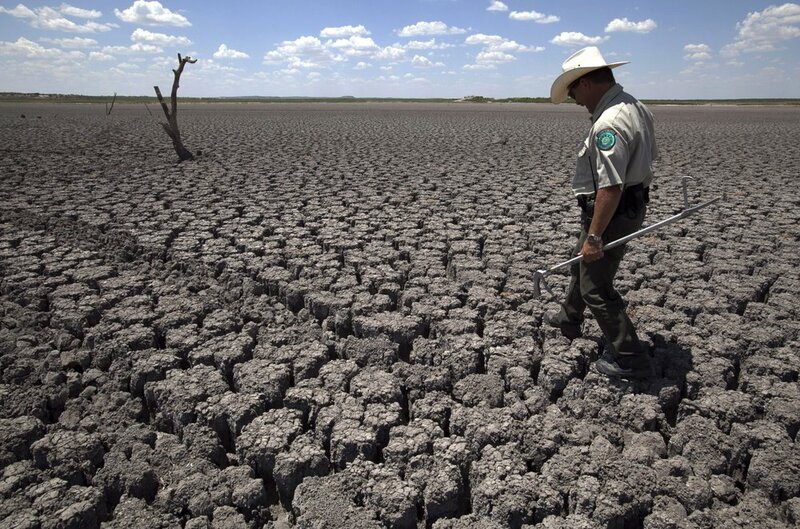 As a result, we are seeing a reduction in extreme temperatures. Note that it starts in 1958. Why should that be? After all, the stations used in their analysis all have data going back to 1920. In other words, ties are included, and consequently records should, in theory, be evenly distributed throughout the time scale. Given this, you can see straightaway that hot records have actually been declining since 1958. This, of course, rather destroys their argument that we are breaking the “warm end of the spectrum” more and more. 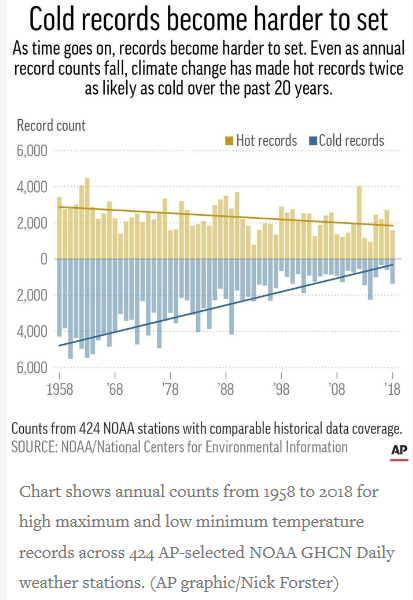 All that we are seeing is that cold records have become much less common. 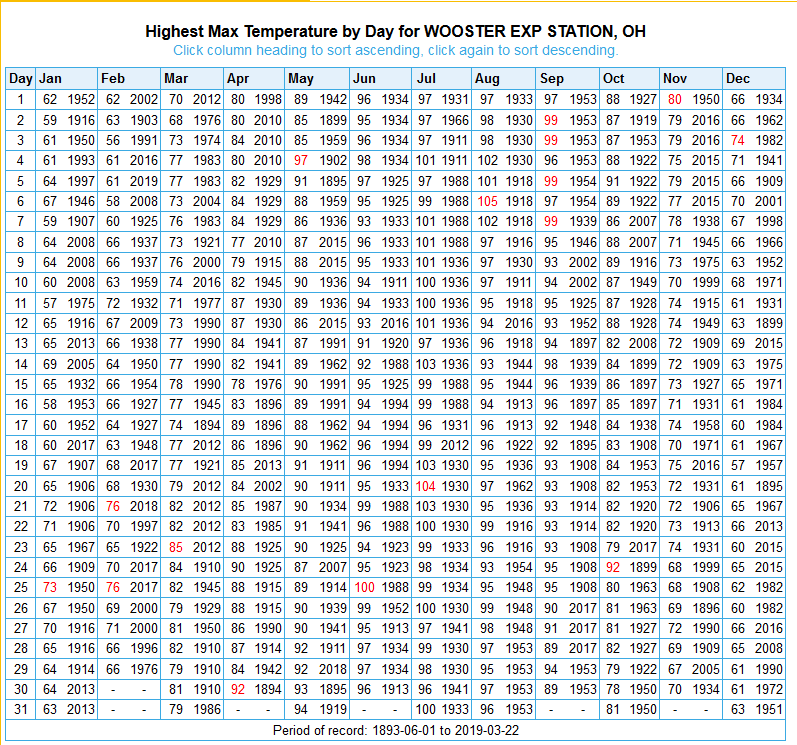 They present Wooster, OH as a good example. So let’s look at the full record there, which actually goes back to 1893. The CLIMOD2 climate tool supported by NOAA gives temperature records for each day of the year. The reason why AP decided to hide the data prior to 1958 becomes immediately obvious. 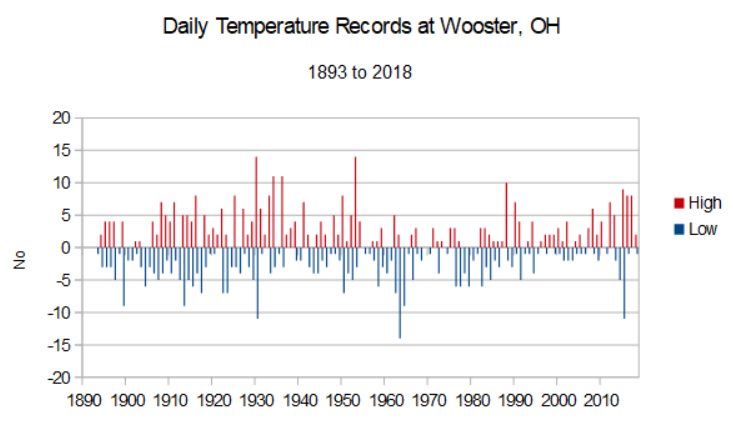 Hot records were far more common not only in the 1930s, but 1950s as well. We also see far fewer cold records since around 1990. It is that lack of cold records which has skewed the ratio of hot/cold, and not an increase in the hot ones. In fact, the opposite is true. The number of extremes, hot and cold added together, have been getting fewer in recent years. It turns out that there is no evidence of this either, at Wooster at least. 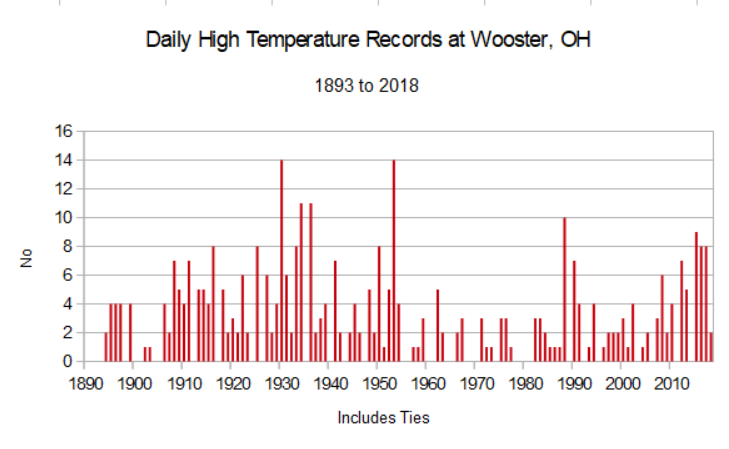 The chart below the highest temperature recorded each year, and we can see that were routinely much higher in the past. The second chart gives the number of days each year above 90C, and shows a similar pattern. What does stand out in the latter is the run of cool summers in the 1960s and 70s. 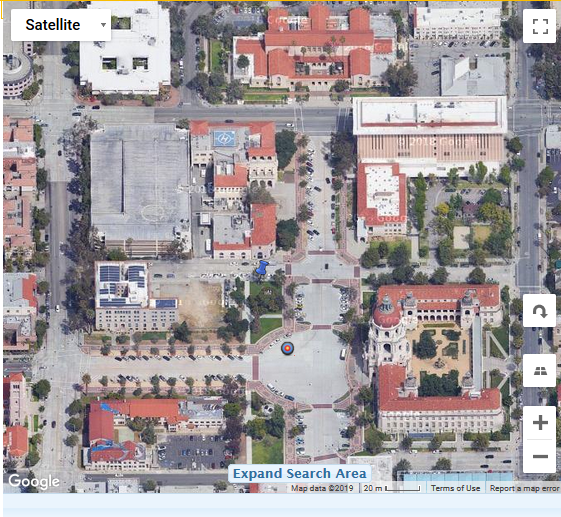 Maybe Wooster is not representative of the rest of the country, so let’s look at the other example used, Pasadena. The first thing to note is that the weather station there is slap in the middle of the city with a population of 142,000. It is surrounded by large buildings and close to roads. Certainly not a proper site to measure climate trends at! 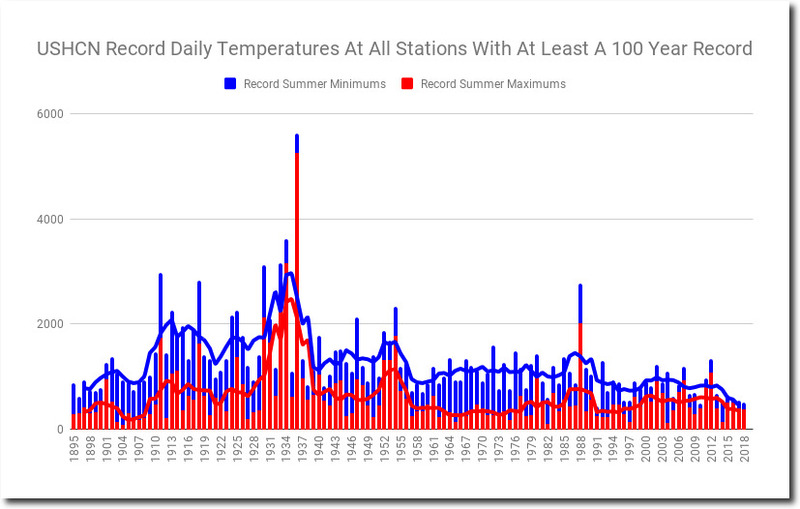 Borenstein claims that we are seeing more and more “record breaking heat” and “more extremes”. The opposite is true. 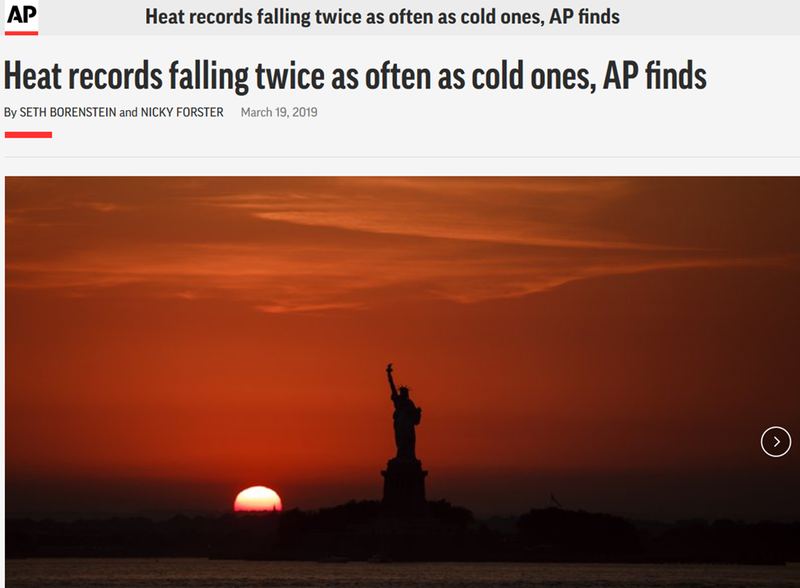 Hot records are less common than in the past, and cold records have become even rarer. As a result, we are seeing a reduction in extreme temperatures. Tony Heller has also done his usual demolition job on the Borenstein report. Tony’s post is well worth a read here.